'Teachers Research!' is the name we are using for a particular kind of participant-focused event - and associated writing process - for sharing of teacher-research. The rationale and format are described in the book chapter 'The concept, and spirit, of "Teachers Research!"' (Smith 2015). Basically, the format involves 3-5 minute oral presentations (up to 6 or 7, perhaps) in front of a poster, followed by 'gallery-style' interaction, sometimes rounded off by discussion in the whole group for a total of 75 to 90 minutes. The presentations can be photographed and audio-/video-recorded and further disseminated on a website, and recordings can be transcribed to form the basis for written reports (see Appendix for instructions that can be given to presenters and chairs of sessions). Aza, Izé Balsemão Oss and Smith (forthcoming) report on one recent event which has adopted this format - 'Teachers Research! Chile 2016' - where, additionally, plenary sessions featured groups of teacher-researchers, not 'outside experts'. Underlying connections of this kind of event with teacher-learner autonomy are indicated by Barfield and Smith 1999. From a more affective perspective, teacher-researchers can find the experience of presenting and writing about their research quite daunting, especially when the norms expected are 'academic' ones. Particularly, perhaps, when teachers lack time or are not interested in academic approval, the use of posters rather than powerpoint slides, and documentation via uploading of photographs and audio or video to a website (plus, optionally, drafting of individual reports on the basis of recordings) can be appropriate context-sensitive alternatives. Innovative, teacher-friendly forms of sharing teacher-research (with teacher-learner autonomy in mind) first started to be pioneered via experimentation with genres during 2012-13 within the IATEFL Research SIG 'Teacher-research updates' web-pages. This culminated in the Teachers Research! event in Harrogate in 2014, which was documented in a multimedia, online record of the day: Teachers Research! Posters, Talks, Discussions, compiled by Richard Smith, with Daniel Xerri, Yasmin Dar & Ana Inés Salvi (2014, IATEFL). The concept underlying the Teachers Research! style of sharing via poster presentations, interaction and discussion has subsequently been exended to the organisation of larger conferences in Izmir, Turkey (June 2015), Santiago, Chile (March 2016), Istanbul, Turkey (June 2016, 2017, 2018) and Buenos Aires, Argentina (May 2017). 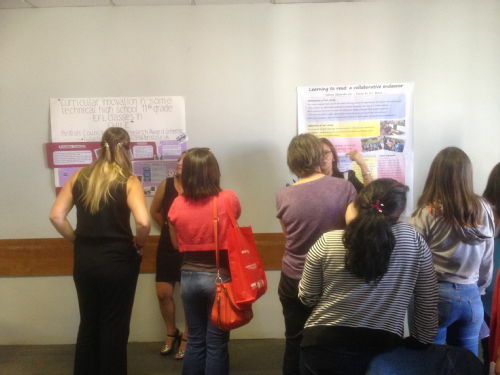 The idea of encouraging writing-up of individual reports from recording of an oral presentation in front of a poster was developed with Paula Rebolledo and implemented for the first time at the end of the first Chilean Champion Teachers project cycle in Chile, in January 2014) (see Smith, Connelly and Rebolledo 2015). Innovative writing-up of research has been further pursued in an online e-book arising from the same project: Champion Teachers: stories of exploratory action research, edited by Paula Rebolledo, Richard Smith and Deborah Bullock (2016, The British Council). Currently (April 2018) a follow-up book of stories from the equivalent projec tin Peru is being prepared, for publication by the British Council later in 2018. Aza, L., Izé Balsemão Oss, D. and Smith, R. Forthcoming. 'Reflections on "Teachers Research! Chile 2016"'. ELT Research. Pre-publication version. Barfield, A. and Smith, R. 1999. ‘Teacher-learner autonomy: Ideas for conference and workshop design’. In Proceedings of Teachers Develop Teachers Research (TDTR) 4 (CD-ROM). Whitstable, Kent: IATEFL. Bullock, D. and Smith, R. (eds). 2015. Teachers Research! Faversham: IATEFL. Smith, R. 2015. 'The concept, and spirit, of "Teachers Research!"'. In Bullock, D. and Smith, R. (eds). Teachers Research! Faversham: IATEFL. Smith, R., Connelly, T. and Rebolledo, P. 2014 ‘Teacher-research as continuing professional development: A project with Chilean secondary school teachers’. In Hayes, D. (ed.) Innovations in the Continuing Professional Development of English language teachers. London: The British Council, pp. 111–128. Rebolledo, P., Smith, R. and Bullock, D. (eds). 2016. Champion Teachers: stories of exploratory action research. London: The British Council. Since the format is a little unconventional we thought we'd send you a few notes in advance about how the sessions should be organized. We've attached the draft of the programme and instructions sent to presenters [above] for your information. You might like to explore the website of the Harrogate 2014 event given at the bottom of the instructions for speakers [above] to see how a previous event worked in the style envisaged. All presenters need to make sure their posters are on the walls before the beginning of the session – please be there early and make sure this occurs! [first 20-25 minutes] 5 minutes for each presenter in front of their poster – please indicate 'time is up' quite assertively, with an alarm on a mobile phone or by tinkling a glass with a pen. You can show a 'one minute more' sign if you like after 4 mins. [next 30 to 40 minutes] : people walk around and interact with the poster presenters in front of their posters. If the rooms are really too crowded we will have to think again, for example putting some of the posters in the corridors during this part. It is fine if people want to wander in and out of other rooms during this part. Could you charge your mobile phone up and try to take a video or at least make an audio-recording on your mobile phone of every 5 minute presentation? Also, take a well-focused photo of every poster — on its own (one shot) and with the presenter standing in front of it (one shot) - and one photo just of the presenter's face? And please try to ask presenters if they mind these being uploaded to a website. Could you then send these to [organizer's email address here] or upload them to the following web-page: https://www.facebook.com/groups/1667532090151304/: it's a good place for sharing photos etc. of the conference.